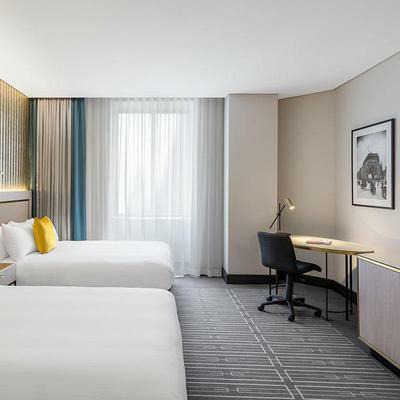 Brintons worked together with Bates Smart to create a collection of striking woven Axminster carpets for the guestrooms, suites and corridors at the historic Radisson Blu Plaza Hotel, Sydney. 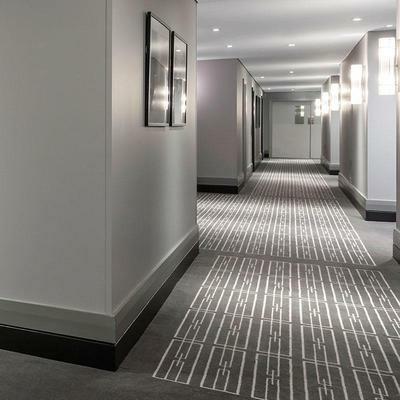 Over 32,000 sqm custom designed high-performance Axminster carpets were supplied to levels 2-12 of the hotel. The carpet designs were conceptualised by Bates Smart and translated by Brintons designers into a stylish, workable solution for the floor. 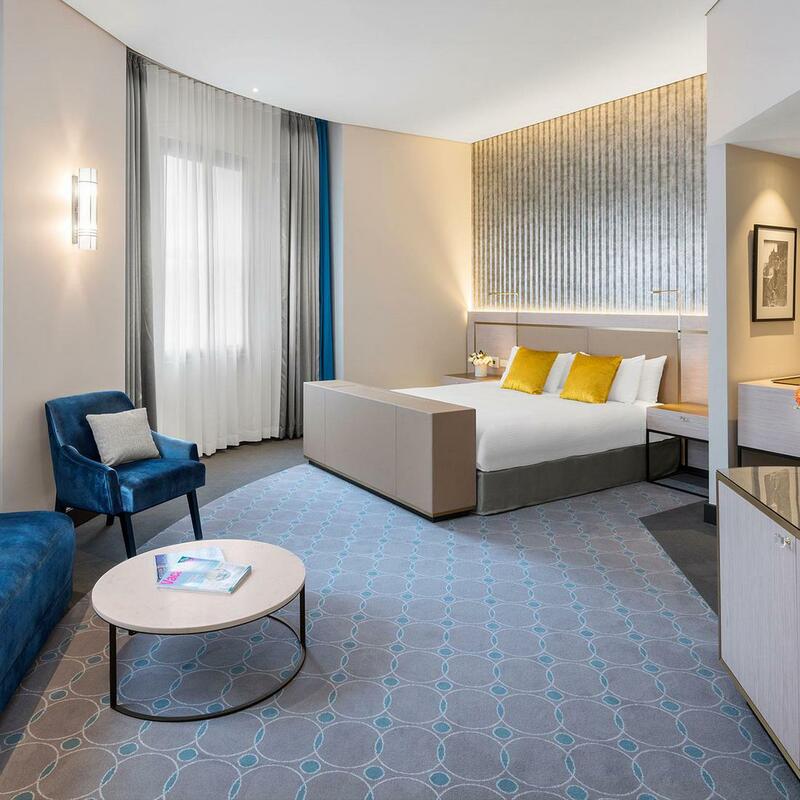 Brintons designers mastered the intricate linework placement within each of the room types to achieve Bates Smart’s vision of effortless balance and symmetry. 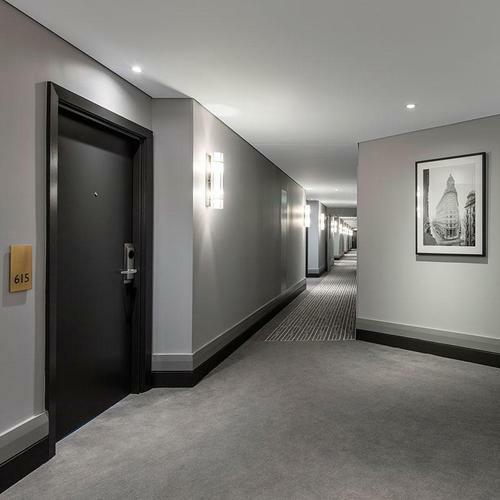 Precision was essential in achieving the desired metallic grey flooring colour palette. 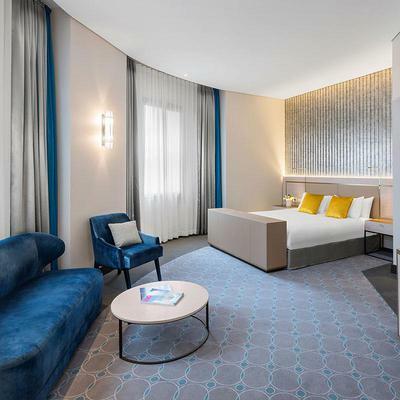 Brintons Australian design team, together with Brintons’ inhouse colour and dyeing experts around the globe, worked seamlessly with Bates Smart’s designers to develop the exact tonal value required. Brintons provided a full complement of sampling to facilitate the design conceptulisation and approvals process. This included bespoke colour development, design print outs, the production of woven samples for colour and design approvals, flooded-floor plans to assist with the placement of the design details in each room type, production carpet for room mock ups through to the final woven carpet production.